Are High Doses of Rose Hips Dangerous? Some rose species produce "hips" in the fall. Rose hips are fruits of the rose that appear after the shrubs finish flowering. Rose hips are high in vitamin C, also known as ascorbic acid. Although side effects of high doses of rose hips are not typically dangerous, talk to your doctor about your specific health conditions before using dietary supplements. According to the National Institutes of Health's Office of Dietary Supplements, the recommended daily amount of vitamin C from food and supplements is 75 mg for adult women and 90 mg for adult men. Teen girls need 65 mg and teen boys need 75 mg. Pregnant teens and adults need 80 to 85 mg of vitamin C each day, while those who are breastfeeding should up their intake to between 115 and 120 mg Vitamin C.
If you use a rose hip supplement or tea blend, check the label to determine the vitamin C content. To avoid side effects, do not take an excessive amount of rose hips or other ascorbic acid products. The National Institutes of Health sets the limit for teens at 1,800 mg vitamin C and 2,000 mg for adults. A rose hip supplement may contain as much as 1,000 mg of the nutrient per capsule, while 1 cup of rose hip tea can contain 2,000 mg. If your doctor recommends a vitamin C supplement for a special condition, ask exactly how much of the vitamin you should take. Any side effects from excessive rose hip intake would likely come from excessive ascorbic acid. This possibility is likely only in supplements with extra ascorbic acid added. By themselves, rose hips present a minimal threat for vitamin C overdose. To achieve an intake of even 1,200 mg vitamin C from regular rose hips, you would need to use an unrealistic 100 g of plant material each day. Vitamin C overdosing is not considered life-threatening. Potential side effects include headache, dizziness, nausea, diarrhea, stomach cramps, heartburn or flushed skin. People allergic to ascorbic acid might experience more intense reactions, such as swelling of the face or tongue. Always seek emergency medical attention if your symptoms are severe. 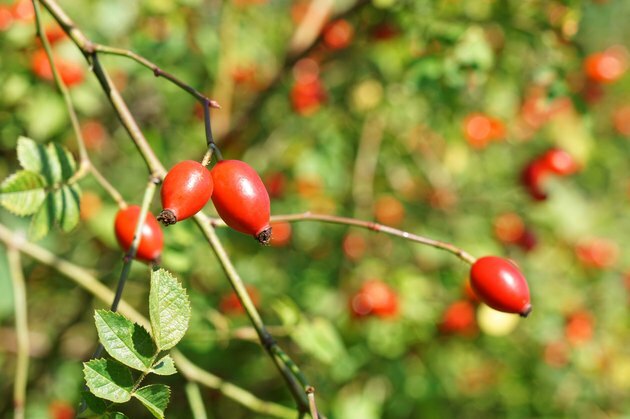 The greatest concern involving rose hip overdosing centers on potential harm to the kidneys. Medicines already considered potentially harmful to the kidneys, such as acetaminophen and certain prescription medications, can become even more dangerous when combined with too much ascorbic acid. Rose hip and vitamin C supplements can interact negatively with blood thinners, some antibiotics and barbiturates, aspirin and nicotine patches. Check with your doctor to determine if rose hips might form a health threat if combined with any medications you take. Because rose hips have not been studied for fetal and infant safety, pregnant and breastfeeding women should avoid rose hip products. People with kidney disease or who are taking medications potentially harmful to the kidneys may be advised to avoid vitamin C supplements of any kind, including rose hip products. People with allergies to ascorbic acid in any form also should avoid rose hip products.